Fen Xia, M.D., Ph.D., (right) chair of the Department of Radiation Oncology, and Central Arkansas Christian School students display radiation masks they decorated as part of CAC’s art program “Paint Over Pain” to represent beauty that can come from hardship. April 8, 2019 | Transforming something frightening into something inspiring isn’t an easy task. But that’s exactly what students at Central Arkansas Christian (CAC) School set out to do for patients undergoing treatment at the UAMS Radiation Oncology Center. “I love the idea of being able to inspire the patients and bring a little bit of light into a difficult situation,” said high school student Shelby Lyons, who, along with her mom, Jennifer, developed the idea for a one-of-a-kind art display at the center. A UAMS radiation therapist, Jennifer Lyons knows first-hand the fear and uncertainty patients encounter when faced with a cancer diagnosis. The treatment itself, particularly for patients with brain tumors or other head and neck cancers, often adds an additional level of anxiety to an already scary situation. “Radiation therapy for brain tumors and head and neck cancers requires the patient to be perfectly still, so we can very precisely target their tumor,” Lyons said. This means the patient must be fitted for custom-made radiation mask to wear during treatment. Made of moldable plastic mesh, the mask is gently placed over the face and secured to the treatment table during radiation therapy. The masks before decoration were moldable plastic mesh masks worn during radiation therapy for head and neck cancers. Brain tumors can start either in the brain or spread to the brain from other places in the body. Cancers that are collectively known as head and neck cancer usually begin in the squamous cells inside the moist surfaces of the head and neck. These cancers can affect the oral cavity, throat, larynx (voicebox) and nasal cavity. “Using the mask is necessary to keep the patients safe during treatment, but it can be a source of anxiety for many people,” Lyons said. To ease these fears, Jennifer and Shelby Lyons developed the idea for a partnership between the Radiation Oncology Center and CAC’s art program. 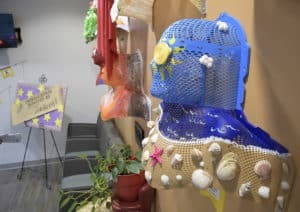 Called Paint Over Pain, the project allowed students in CAC’s Painting 1 and Advanced Art classes to use their artistic talents to decorate radiation masks, which would then be displayed in the center’s waiting room. “When Jennifer proposed the idea for this art project, I thought it was wonderful. Not only is it inspiring to see the talent of these young people, it also shows the level of compassion and dedication that our radiation therapists feel for our patients,” said Fen Xia, M.D., Ph.D., professor and chair of the Department of Radiation Oncology in the UAMS College of Medicine. Working in teams under the direction of art teacher Chelsea Baber, about 25 students decorated eights masks representing everything from Spider-Man to a Greek goddess and a gypsy. Adorned with paint, feathers, seashells and even a beard, the masks hang in the center’s waiting room with a plaque honoring the project. Each student’s name is found under their respective mask. “These were just plain white mesh plastic when the students received them. Now, they represent the fact that beauty can come from hardship,” said Loverd Peacock, M.D., radiation therapist and professor in the Department of Radiation Oncology.